Ethan continues to recover from his surgery over a week ago (Oct 31). His surgery was a success and he does not have any more post op pain – Yea!!! As Ethan continues to work on restarting his stomach/GI systems, we wait for his discharge from the hospital. It looks as if this coming week will be the week he is discharged – stay tuned to Facebook for updates. Tomorrow (Nov 10), we will get the opportunity to spend time with Ethan alone in the surroundings of our choice. We have been granted a Day Pass from the hospital and will be busting Ethan away for fresh air, sunshine, time with his dog Cincy and the rest of his loving family and the opportunity to be home for a few hours. The Day Pass is another key part of our journey before bringing Ethan home. We are excited and terrified for tomorrow and the days, weeks and months ahead. Our Medical Team reminds us constantly that the rate of rehabilitation increases once the patient returns home and begins working in an out-patient setting. We look forward to this rate increase. We have a feeling the rate of craziness and uncertainty will increase too. BRING IT ON. Through the past 19 weeks, we have learned that we can accomplish any challenge, fill any need by leaning on Team Ethan – Thank You. We will be seeking as much or more support as we enter this next chapter in our journey with Ethan. 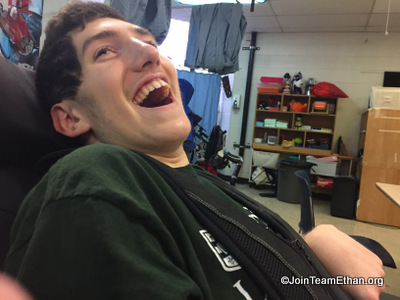 For those interested in helping directly with Ethan’s medical needs and expenses – tax deductible contributions can be made at HelpHOPELive which support Ethan directly:.